The New Orleans Regional Transit Authority (RTA or NORTA) is a public transportation agency based in New Orleans. The agency was established by the Louisiana State Legislature in 1979, and has operated bus and historic streetcar service throughout the city since 1983. With an annual ridership of over 18.6 million riders, the Regional Transit Authority is the largest public transit agency in the state of Louisiana. City buses were used before Hurricane Katrina hit to transport people to a refuge of last resort, the Louisiana Superdome. Much of the city flooded due to the storm. The NORTA Administration building on Plaza Drive appears to have been in 10 feet (3.0 m) of water. Almost eighty-five percent of the fleet was rendered useless and inoperative; 146 city buses were visible outdoors in the flood at the 2817 Canal St. facility, while only 22 were at 3900 Desire Pky. The 8201 Willow St. facility was one block within the flood but was built above street level. The buses at the flooded facilities were mostly written off. All but one of the streetcars built in the 1990s and 2000s were severely damaged in the flooding resulting from the hurricane. The historic Perley Thomas-built streetcars of the St. Charles line were undamaged in the disaster. The damaged streetcars, which had been built by hand on the property by local workers, were repaired in the same facility with components from Brookville Equipment Co.
As of 2007[update], service had been restored to certain areas as they became habitable again. However, there was no 24-hour service on any bus or streetcar line, except for the St. Charles streetcar line. Streetcars were returned to the full length of Canal St. and the Riverfront, initially using the historic St. Charles Line streetcars, which had not been damaged, as had the red Canal cars. In 2008, the St. Charles streetcar resumed running the entire length of its route. By early 2009, the red Canal streetcars were repaired and had taken over service on the Canal and Riverfront Lines. The buses that have been restored to operation have returned to several major thoroughfares, including Elysian Fields Avenue, Esplanade Avenue, Claiborne Avenue, St. Claude Avenue, Judge Perez Drive, General Meyer Avenue, Lapalco Boulevard, Robert E. Lee Boulevard, and the Chef Menteur Highway. 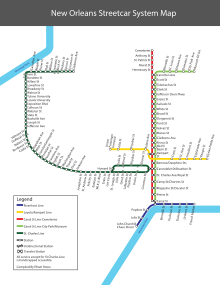 And just a few express routes, Morrison Express, Lake Forest Express, Read-Crowder Express and Airport Express, serving both Eastern New Orleans, and New Orleans Louis Armstrong International Airport in Kenner, La. have been reinstated so far. Operate the new N. Rampart/St. Claude Avenue streetcar from Elysian Fields to UPT via Rampart St. and Loyola Ave. Loyola/UPT line will no longer operate on Canal St. to the river, nor on Riverfront to the French Quarter stop. Restore service to Canal Street on the 15-Freret and 28-MLK buses. Increase service on the Canal and Riverfront streetcar lines. Continue lines 57-Franklin and 88-St. Claude to Canal St. Operate 57-Franklin via Claiborne Ave. to increase service along N. Claiborne Ave. between Elysian Fields and St. Bernard Ave. Decrease travel times for riders from farther-out neighborhoods by operating Lines 88-St.Claude and 91-Jackson/Esplanade with fewer stops along Rampart to Canal. Improve reliability of lines 5-Marigny/Bywater and 55-Elysian Fields with new schedules. Provide earlier daily trips and later weekend trips on line 80-Desire/Louisa. 52 St. Bernard – Paris Ave. The body in charge of making major decisions for the RTA is the Board of Commissioners. The board consists of appointees by the Mayor of New Orleans and of some appointees by the President of Jefferson Parish. The RTA Board has the overall authority for transit in New Orleans including setting fares, overseeing service and operations, developing operating budgets, approving each year's annual transportation development plan, and deciding upon capital purchases and expansions. Under contract to the RTA Board of Commissioners, Transdev manages all day-to-day aspects of the transit agency on behalf of the RTA Board. Transdev handles operations and service, safety issues, vehicle maintenance, customer care, route design and scheduling, human resources, administration, ridership growth, capital planning, grant administration, communications, purchasing, and other agency functions. Transdev is under contract to and reports to the RTA Board of Commissioners. The company operates public transportation for some 5,000 transit authorities around the world. Transdev (then Veolia Transport) was hired in 2008. ^ "RTA History". www.norta.com. Retrieved 2018-07-02. ^ "October 2, Service Changes for Bus And Street Car Lines". Retrieved 2 October 2016. ^ Donze, Frank. "New management team to run city's Regional Transit Authority". NOLA.com. Retrieved 2017-01-16. Ride New Orleans, a not-for-profit transportation policy and research organization. This page was last edited on 5 November 2018, at 06:40 (UTC).